Your teeth and mouth will feel sore after you've started your orthodontic treatment or have recently had braces tightened. This discomfort normally lasts for about a week, and it can be hard to eat during this time! Here are some tips to make it easier. Softer foods will be easier on your teeth and lessen discomfort. Cut out hard, sticky and chewy foods. 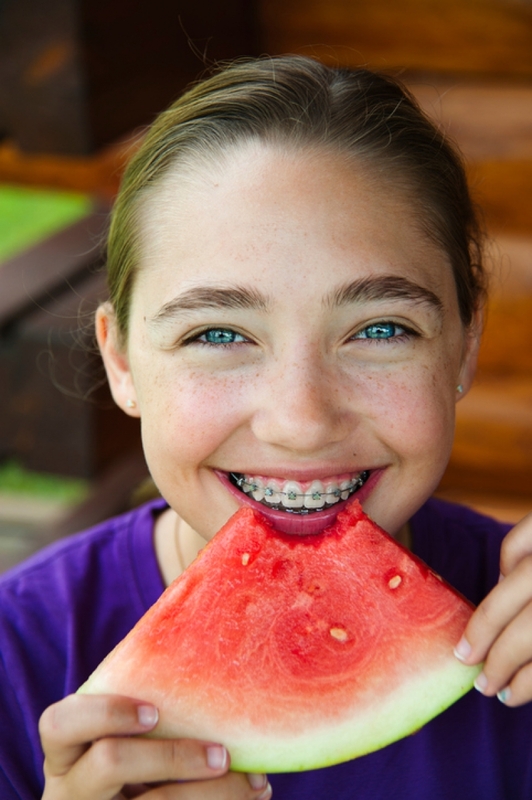 These types of food be painful and difficult to chew, but they can also damage your braces. Cut your food up in small pieces. Cut your food into bite-sized pieces rather than biting into bigger pieces. For example, cut up an apple into thin slices or small chunks rather than just biting into it to make it manageable with braces. Taking steps like these will help you manage pain and protect your braces from damage, while also making more dietary options available to you. Chew with your back teeth. Your back teeth are bigger and less sensitive to pain than your front ones. Avoid tearing or pulling at foods with your front teeth (as mentioned, cutting your food into smaller pieces can help). Instead, place smaller pieces of food directly toward the back of your mouth. Try to make a point to eat more slowly and chewing carefully. You'll probably be doing this anyway if your teeth are quite sore, but if you find yourself rushing, make a point of slowing down and chewing carefully. Taking some of the above steps will really help make chewing easier during those times when your braces are hurting you. If you have more questions on how to manage pain, contact our Vancouver orthodontics practice today! The day your braces come off is an exciting one, both for patients, and for orthodontists, too! But now that the braces are off, the maintenance portion of your treatment begins.